Take to the trails of the San Gabriel Mountains and find out why they are most popular mountains for hiking in SoCal. The front country offers inviting arroyos, fine vista points and easy-to-access trailheads. 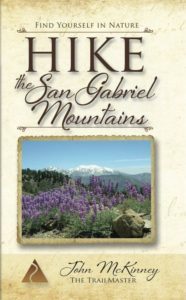 For the best hikes in the San Gabriel Mountains, head for the high country and enjoy fresh alpine air, grand mountain peaks and a wealth of taller trees. Refresh your spirit in nature nearby. Enjoy easy-to-access and classic trails through Big Santa Canyon and to Mt. Wilson, Mt. Lukens and Mt. Lowe. Cool-off in Icehouse Canyon, chill-out at San Antonio Falls, Eaton Canyon Falls and the San Gabriel River. Experience the alpine delights of Angeles National Forest with ascents of Mt. Islip, Mt. Williamson and Mt. Baden-Powell.